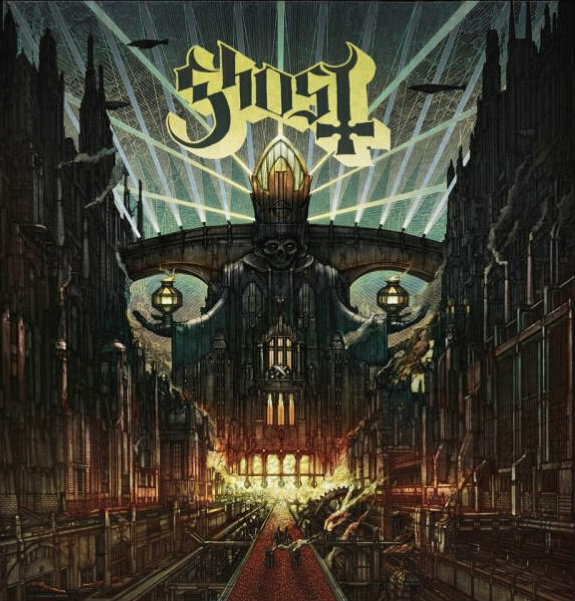 Ghost – Meliora – Spinefarm Records – Release: Out Now. One would be happy to see the illustrious Ghost back with their third album. Unfortunately the band had to say goodbye to the enigmatic Papa Emeritus II, because… well, he just wasn’t evil enough to take down the world order. Luckily the band have found his three month younger brother more than adequate to fill in his older brother’s mitre. Now it’s time to submerge yourself in the new devilish outing that is “Meliora”. What an opening when “Spirit” starts up with a superbly haunting sci-fi piece, straight from the best B-movies of yore! It really illustrates Ghost so well; spooky stories, not meant to be really taken too seriously, and a love for the classics. I’ve heard people who see “Meliora” as being closer to the first album, others closer to the second and some even say in-between. I’d put myself in the last camp and I guess you could say that “Meliora” has turned out to be the missing link between “Opus Eponymous” and “Infestissumam” as those two albums were quite different in style. “Meliora” carries both, while still very much retaining an identity of its own. The songs have the more accessible flavour of the second album, yet on occasion the mood lies closer to the debut album, a certain occult feel. “From the Pinnacle to the Pit” has a blues-rock kind of feel to it, yet with the chorus you instantly recognize one of the typical Ghost styles. It really is remarkable just how much Papa Emeritus III sounds like his older brother Papa Emeritus II. That must be one hell of a musical seed his sire carried and we are the lucky ones. Speaking of the occult, “Cirice” has a very appetizing haunting feel to it, while having a very heavy doom sound and the catchy chorus is very likely to make it one of the live favourites. As a small interlude we get a preview of a song yet to come, under the name of “Spöksonat”, which softly guides us towards the beautiful “He Is”. An older Ghost song from some eight years ago which was never recorded. Selim from The Devil’s Blood often pushed the band to record it and after his death in 2014 Ghost decided to honour his request and it is a very good thing they did so. It is one of the softer songs that Ghost have recorded and one of the most romantic as well, telling a story of lovers. Another short intermezzo is “Devil Church”, which was originally meant to be a part of “Cirice”, but got turned into its own little short song. With the organ, choirs and guitar riffs this song almost puts me into an old chapel, filled with people singing hymns. But something’s not quite right here as the fade-out shows. “Absolution” brings us another old school doom rocker and while the lyrics paint a bleak time, the chorus really feels very uplifting with its main focus on keyboards and piano and the recognizable lyrics make for a great sing-along. Ending the album is “Deus In Absentia” which sort of sounds like an anthology of a large part of Ghost’s work, yet the burlesque-ish parts give it a nice face of its own. It’s a catchy closer for the album and it ends the album with choir that gradually turns more sombre and haunting near the end. 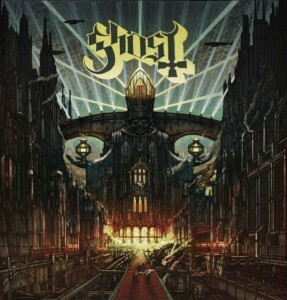 Ghost have always been a band that divided music lovers and “Meliora” won’t really make any change in that. It reveres the band’s history, while at the same time looking forward.